To play this requires waaaaay more information than you gave us. We need to know what clef these two notes are written in. We also need to know what key signature. A good way to give us this information would be to tell us at what point in the song this is played. If it's treble clef in C major, the two notes are A and C. These could have pretty much any context imaginable, so that's as far as we can really analyse. To play it, play the C one octave above middle C and the A below the C you played. If this is bass clef in C major, the notes are C and E. Play the C below middle C and the E above that C.
Here's my shot at explaining exactly what to do without using any music theory terminology at all. Google a list of key signatures and what they look like first. If the key signature is D major or A major, you'll be playing the black note just above that C that you played on either clef instead of the C. Any C becomes C♯. If the key signature is E major, B major, F♯ major, or C♯ major, play the black note above any C and any A instead of those notes respectively. If the key signature is F♯ or C♯, play the white notes above E as well. If the key signature is B♭ major, play the black note below the Es. If the key signature is E♭ major, play the black note below any A as well as for Es. If the key is G♭ major or C♭ major, play the white note below C as well as altering the As and Es like before. If it's not in any of these jeys, play just the Cs, Es, and As like normal. 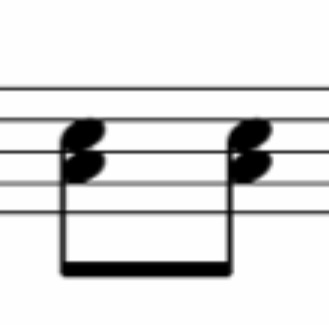 What is this note called?